Invasive species are a major threat to most ecosystems as they have a tremendous impact on biotic interactions. The cascading effects of biological invasions, through multitrophic systems, are however poorly understood. Our biological system is the leafminer Cameraria ohridella. This microlepidoptera attacks horse chestnut trees. Up to a hundred mines can be counted on a single leaf. Attacked leaves become completely yellow and fall from June onwards. The moth arrived in France in 1998 and invaded the country completely in less than 10 years. This leafminer is attacked by a range of parasitoids, most of them being generalists already present in the ecosystem as they also develop on native leafminers. Unfortunately, they do not control the propagation of the invading leafminer at all. By contrast, high density of parasitoids might be a problem for the native leafminers. We have chosen two approaches to model this system. The first is a discrete model and the second is an analytical one. The discrete model simulates the spatial propagation of the leafminers and its parasitoids in France. This model allowed us to make some predictions on the invasion in France since the first appearance at the north-east of the country. The continuous analytical model is composed of two partial differential equations which represent the spatio-temporal evolution of leafminer and parasitoid densities. We explored the stability of the system in the search of conditions enabling a control of the pest. First, we investigated the system without incorporating space. We identified at most six equilibrium points and discussed the existence and stability of each of them. We then carried out numerical simulations of the PDE and we obtained the propagation rate of the leafminer with and without parasitoids. We thereby identified the conditions for which the parasitoids can reverse the leafminer propagation. We also studied the effect of the diffusion rate on the leafminer propagation. Overall, incorporation of space, combined with the polyphagy of the parasitoids, leads to a decrease in coexistence probability, in contrast to several other models in which space promotes coexistence by enabling hosts to escape. The numerical simulations made on the partial differential system show the existence of travelling waves. We are now studying these travelling waves analytically. 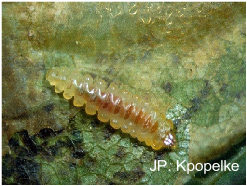 The invasion of Cameraria ohridella has an impact on native leafminers. 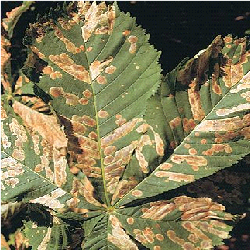 Indeed, leafminer of the horse chestnut tree is a new large reservoir for parasitoids, despite the low parasitism rate. As these parasitoids are generalist, they can attack alternatively or simultaneously several leafmining species. This question of apparent competition is both conceptually interesting and highly relevant, as several other leafminers are currently invading Europe. If the native leafminers disappear due to the action of the large population of parasitoids from Cameraria, they will not function as reservoir for the next waves of invasion. Magal, C. & Cosner, C., Ruan, S., J. Casas (2008) Control of invasive hosts by generalist parasitoids. Mathematical Medicine & Biology, 25: 1-20.